This is the home page of ws-rest.org, which is hosting various sites for REST-related activities both for researchers and practitioners. 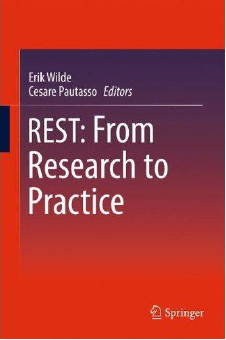 It is the home of the WS-REST workshop series, and of REST: From Research to Practice and REST: Advanced Research Topics and Practical Applications , two books about REST research and practical considerations. First International Workshop on RESTful Design (WS-REST 2010), hosted by WWW2010 in Raleigh, NC. Second International Workshop on RESTful Design (WS-REST 2011), hosted by WWW2011 in Hyderabad, India. Third International Workshop on RESTful Design (WS-REST 2012), hosted by WWW2012 in Lyon, France. Fourth International Workshop on RESTful Design (WS-REST 2013), hosted by WWW2013 in Rio, Brazil. Fifth International Workshop on RESTful Design (WS-REST 2014), hosted by WWW2014 in Seoul, Korea. Sixth International Workshop on RESTful Design (WS-REST 2015), hosted by WWW2015 in Firenze, Italy. Seventh International Workshop on RESTful Design (WS-REST 2016), hosted by ICWE2016 in Lugano, Switzerland. Eighth International Workshop on RESTful Design (WS-REST 2017), hosted by WWW2017 in Perth, Australia. Ninth International Workshop on RESTful Design (WS-REST 2018), hosted by WWW2018 in Lyon, France. REST: From Research to Practice, published by Springer. REST: Advanced Research Topics and Practical Applications, published by Springer. If you have comments about this website in general or any of the activities listed above, please contact the WS-REST chairs.